I used 3 coats of the gorgeous Jill Stuart Milky Freesia from the Bare Petal 2012 Spring collection as my base. It's a sheer milky violet and it's sooooooo pretty! I then sponged China Glaze Medallion onto the tips concentrating most of the glitter on the top 1/3 of my nail. Below is a blurry shot which I took totally unintentionally but it shows off the awesome gold glitter with holographic pieces nicely in the bottle. Thanks for looking as always! Don't forget to enter my 2nd birthday giveaway here! Thanks Su! My pics make the polish look more pink than violet doh. I tried once doing something similar. Let's just say that polish remover was used right after. But you've inspired me to try again as the result is gorgeous! Oh I do hope you try it again Ria!! When I 1st tried glitter gradient manis they sucked so badly but practise makes perfect ;) plus the right type of glitter is important! It's sooo pretty <3 I really love it!! Love this! Super delicate & cute. And that Jill Stuart bottle is just so gorgeous! Super pretty! 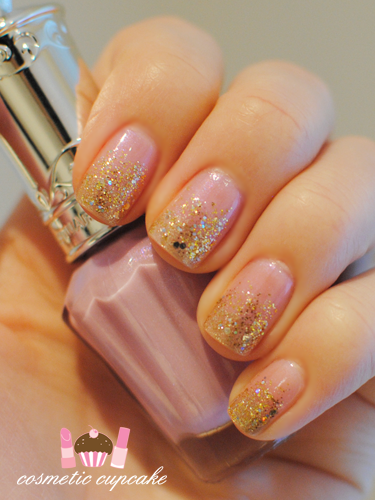 Very girly - the gold glitter gives it a warmer look (if that makes sense). I love seeing manis like this! They look so pretty! I've only tried it once myself and it turned out a complete and utter disaster, but this makes me want to try again. What kind of camera r u using now? Nice shot and pretty nail art .. Absolutely recreating this tomorrow :) Very lovely! I absolutely love this! I've never tried a glitter gradient before, but this looks amazing. This is awesome and I'm going to attempt to recreate it on myself this weekend...question: when you say you "sponged on" the glitter, how exactly did you do that and what did you use to apply it?